For me this is third attempt to complete ML course on Coursera , wish me lack so I have time to eventually complete it. In general I prefer to use Python for my studies, I like IPython, numpy and just Python, but for this course Andrew Ng decided to go with Octave, so I need Octave environment. Octave does not have Windows distribution on home site. So you need to grab one from Octave Forge. 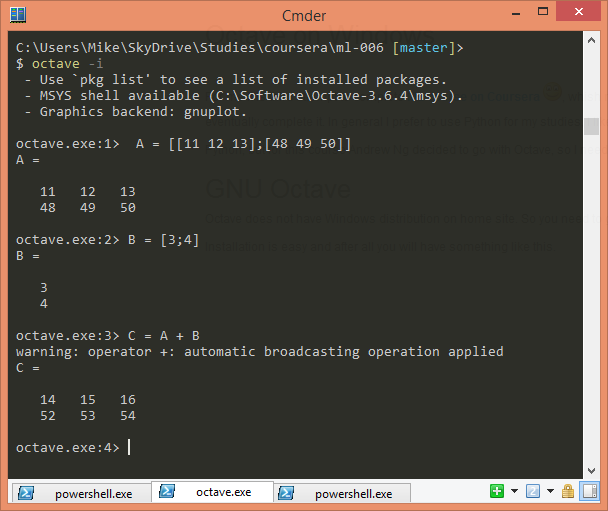 Installation is easy and after all you will have octave.exe on your PATH (if not, just add bin folder to your PATH). There are few items, that I found important for daily use. – Octave outputs huge welcome screen, after you read it and can repeat it word by word at 3:00 AM, you can turn it off. Just add -q when you start octave. Personally I created cmd file that add both of this params for me. Unfortunately, console Octave cannot plot graphs inline, this actually means that it shows plot in different window, with quite wired life time. Comparing to the other environments like IPython, wxMaxima or R Studio, I was sure that I will be able to find something like this for Octave. Actually I was wrong, there are nothing useful, but anyway, I spent some time to investigate and will put here aggregated information about Octave environments. 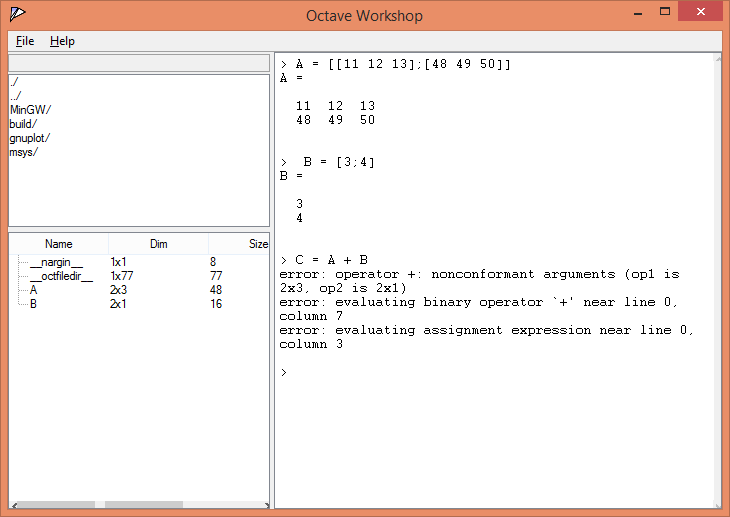 Octave Workshop is firs item that pops up when you search for Octave IDE. Project seems to be inactive, home site is down. If you will take a look at downloads section and find 5 downloads, it probably all y me. In general it works. It has panel that shows variables(good), but actually without values(bad). It bundles quite old Octave 2.9.4. And does not plot inline. Dead end. No value at all. Commercial IDE for Octave, costs $49 for students. Good things are: has variables view, can show actual values of variables. Uses Octave that installed on your system. Bad things: on my system does not plot at all, when plot, still does not plot inline or at least to one of the tabs, it plots to separate window, that makes it quite unusable. Well, my verdict. I would take one for free, $49 is over-over price(take R Studio as base of price judgment). It is not in Internet any more :(. Yeh, that is true. 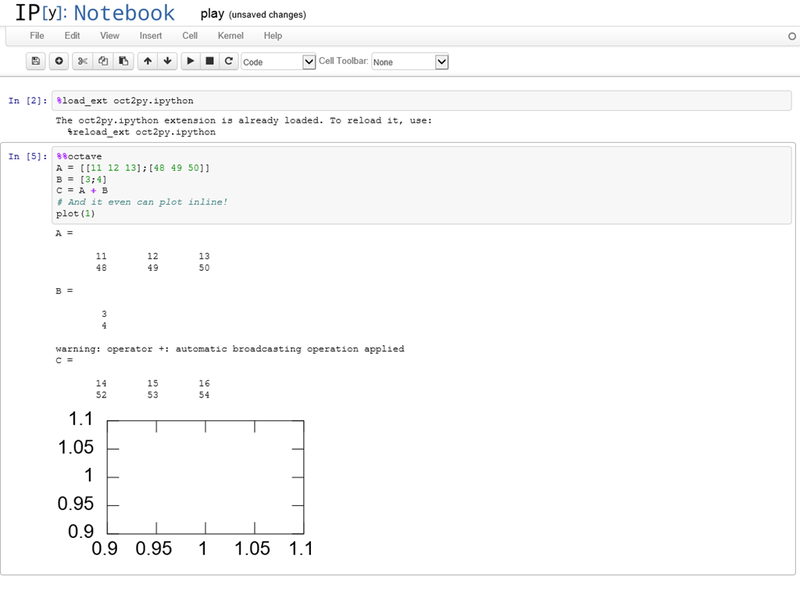 There is magic that enables Octave in IPython. It uses system installed Octave. It can output variables, it can work almost interactively. And it can plot inline! And of course it can exchange variables with main Python session, so after doing something in Octave you can easily play with results in vanilla IPython. For me most visible problem with IPython as environment for Octave is requirement to put “%%octave” on every cell that actually octave cell, but I can live with that. It is obvious, there is not single IDE for Octave that actually meets my requirements. Neither free, nor commercial. Until I will find something useful, I will continue to use console Octave in interactive mode and will also give a try for IPython Octave magic.